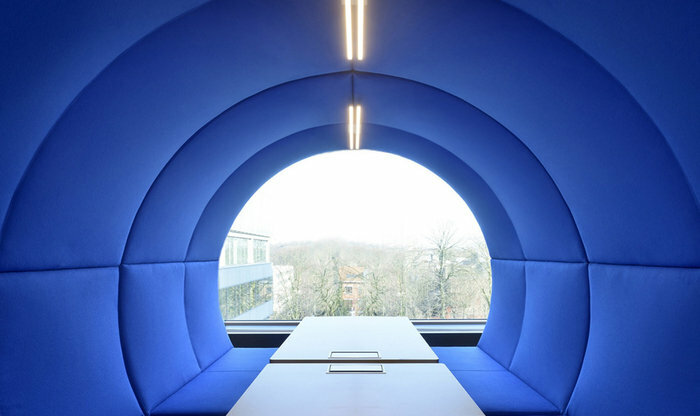 Global Workspaces recently completed the tech lounge offices for Agoria, an organization that protects the interests of its technology industry members located in Brussels, Belgium. Creation over one entire level of a meeting and co-working area for the different members of Agoria, with as purpose the highlight on the latest high level technologies, more specific for audiovisual materials, lighting and furniture. Creation of multiple differentiates spaces on one level, offering various working dynamics, going from collective workspaces, toward individual workplaces, meeting points, meeting and training: open space, cockpit, bubbles, food-truck, exhibition area / showroom, arena, London phone booth, coffee-lounge with fireplace, etc. GLOBAL finalized the development of the project and the bidding in July 2017 and our own general construction company, G-Entreprises, was selected for the realization of works, deadline for delivery is end of December 2017.